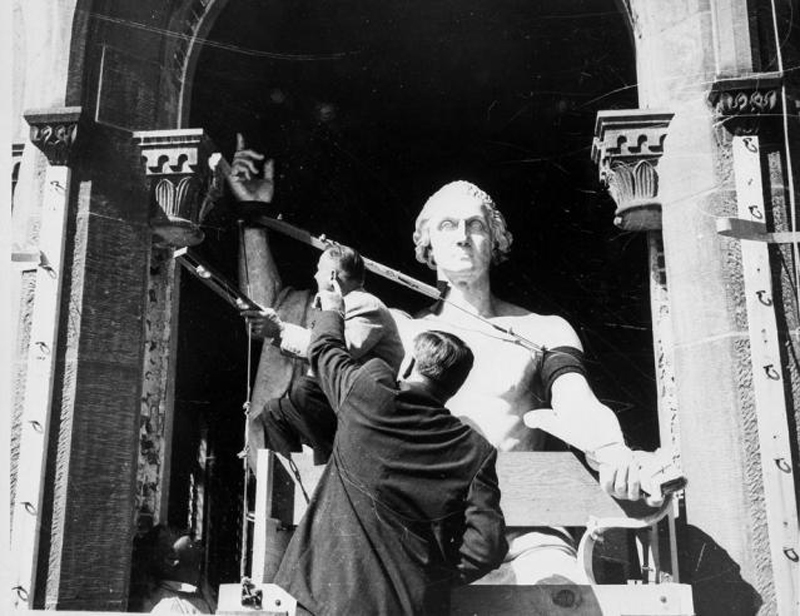 Horatio Greenough, “Statue of George Washington moving across the Mall,” Histories of the National Mall, accessed April 23, 2019, http://mallhistory.org/items/show/487. Horatio Greenough's 1841 sculpture of George Washington has lived in 4 different locations on the Mall. Originally built for the US Capitol Rotunda, Congress did not like the statue and moved it outside to the east lawn 1 year later. Still unhappy with the statue, Congress transferred it to the Smithsonian for display at the "Castle" in 1908. It remained there until 1962, when Smithsonian staff moved the statue by crane across the Mall to the new National Museum of History and Technology. Staff had to remove a glass window and several bricks in the Castle to move the statue out of the building, because it was too large to fit through the doors.